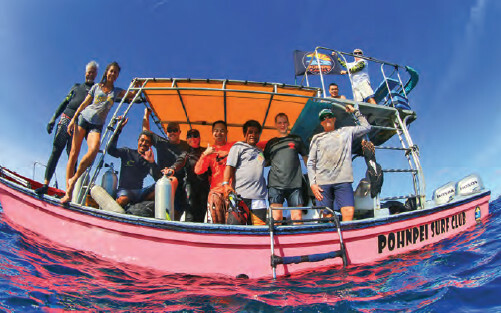 Pohnpei—Allois Malfitani of the Pohnpei Surf Club is in Pohnpei’s waters at some point nearly every day. He has loved the ocean since long before he began to make his living as a surfing, diving, and fishing guide. It’s in his blood and his blood boils when he sees the effect of humans on the environment. “During the fishing tournaments, even 10 miles out there’s so much trash,” Malfitani laments. He said that he took some people out diving today and even from the boat he could see all of the trash in the water and when one of his customers came up from his dive he had a piece of plastic stuck to him. He often takes garbage bags out with him and picks up trash wherever he finds it. It’s unfortunate that he seems to find it everywhere. On Wednesday of last week he put out a request on Facebook and elsewhere for volunteer divers and snorkelers to pick up trash on a part of Pohnpei’s reef. He said that he was really impressed with the response from people, both locals and expats who wanted to help. CSP offered to provide trash bags. Local businesses and individuals called with offers to help fund the cleanup. He said that this time he had it all covered and ready to go this time but that he was really impressed with the interest in the issue. On Saturday, November 25 four divers and eight snorkelers showed up. Malfitani provided enough tanks for each of the divers for two dives. He said that they took off from where the ships are anchored in Dekehtik and drifted with the wind and currents from Sokehs Pass, the Pohnpei Port main channel, toward Palikir pass over the course of three and a half hours. 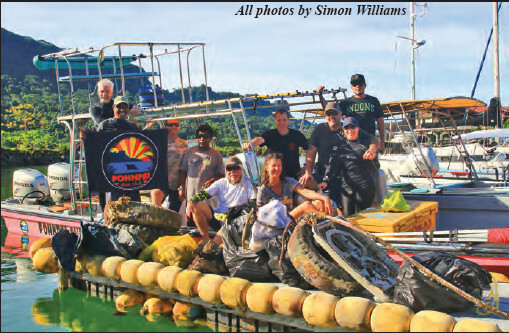 During that time, the volunteers picked up so much garbage from the reef that there was barely enough room for the passengers to get back into the boat. The trash included old tires, bicycle parts, shoes, clothes, cans, and bottles--a veritable potpourri of reef killing, man caused detritus. He said they could only clean within line of sight. They had to leave a lot of trash there either because it had already grown into the reef or just because there was so much of it a diver would not have been able to come back to the surface because of the weight of it. He said that maybe next time he might use salvage balloons to help bring back some of the heavier items. On the day after the reef cleanup he took customers to Ahnd Atoll, a beautiful marine preserve. He and two of his customers each took one large trash bag each and filled them to nearly overflowing within a matter of minutes. “Rosa Willy Hawley and his family and staff members constantly clean the island,” he said, “but the trash keeps floating in from Pohnpei’s main island.” He said that the entire shore at the high water mark on the Pohnpei side of the island is covered in trash that insensitive people carelessly throw away without thinking about it at all. He said that more than anything he wants to make people aware that everything they carelessly discard goes somewhere and that it is having a huge impact on Pohnpei’s ocean ecosystem. He said that he hopes it doesn’t take Pohnpei that long.